USW Local Union 13-2001 is the largest Union at the ExxonMobil Chemical plant and Refinery in Baytown, Texas representing operations, instrument, lab and mechanical employees. The current membership is approximately 700, most of whom are Process Technicians. 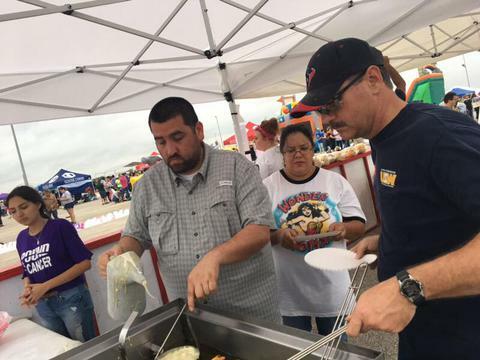 Three other Unions represent employees at the Baytown facilities: the International Association of Machinists and Aerospace Workers, Lodge 1051 (IAM), which represents machinists; and the International Brotherhood of Electrical Workers, Local 527 (IBEW), which represents electricians. available now at Munro’s Baytown and Deer Park. 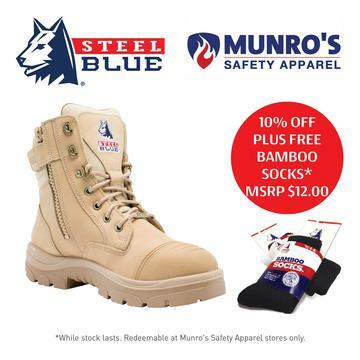 Visit www.munrossafety.com to find out more and for the range of Steel Blue boots. Are you covered in case of an Emergency? Would you need cash should an emergecy happen? Like if you got sick and were unable to work, or develop major health issues, or suffer an accident. To learn more contact Aquarius Johnson at 832-857-2802 or email at atjn223@gmail.com Just click on the link below to see how you can protect you and your family in case of an emergency. Please watch these videos and share with your circle of influence. Were you aware that Union Members get a discount on their AT&T services? The 2018 Bay Area Relay for Life kicked off on Friday, April 6th at 6:00pm. 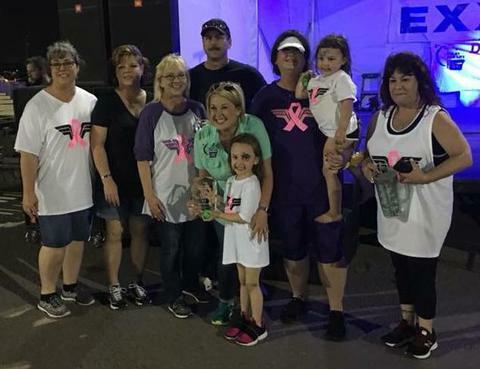 With survivors ranging from 21 plus year survivors to those recently diagnosed, all were there to support one another in the fight, and all were there to raise money to find a cure. 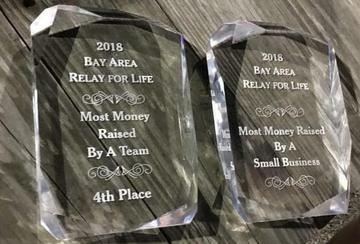 This year the Union’s Relay Team not only surpassed their goal of $10,000 before Relay night but went on to raise a total of $14,180 and winning the “Most money raised by a small business” and 4th Place Most Money Raise by a Team Awards. All this could not have been possible with without the help of all our team members that raised money months before, Ricky Brooks for volunteering to get a Pie in the Face. We want to thank all of the team that came out and help put out over 400 funnel cakes during the night as well as countless bags of kettle corn. 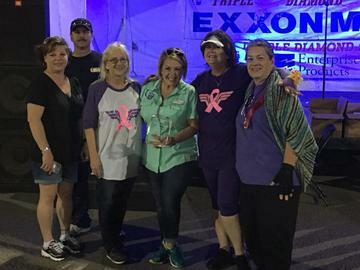 This was the 21st Relay in Baytown and it has been No. 1 in Texas for 15 years as well as being one of the Top 10 Relays in the nation. 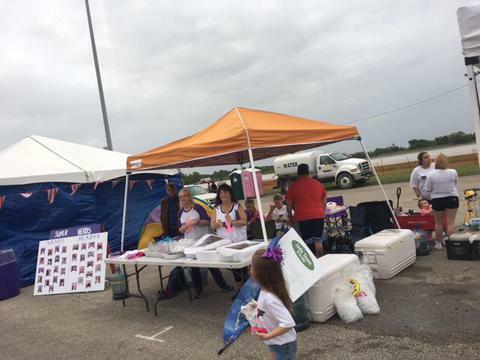 The books will not close on the Bay Area Relay For Life in terms of fundraising until August. That means anyone who wishes to make a donation should log on to the Union’s Bay Area Relay for Life website at http://main.acsevents.org/goto/USW and make a donation. We also want to congratulate our very own Office Manager and Relay for Life Team captain, Pamela Ayala for not only a job well done, but ACS has invited her to attend the Top Partipicants meeting in August in Atlanta, all expenses paid. The company has informed the Union of a change to the AETNA HMO plan. This change requires that for maintenance medications or those medications taken on a regular basis to treat ongoing conditions like allergies, asthma, diabetes, heart conditions etc… The new requirement is that maintenance medications will now have a Mandatory Home Delivery requirement, after the 3rd refill at a retail pharmacy. The AETNA HMO plan will provide coverage for three (3) fills of maintenance medications at a retail pharmacy. For additional refills, these maintenance medications will only be covered when members use the Express Scripts Pharmacy (mail order pharmacy). The Union is of the understanding that each AETNA HMO participant/household has received a letter regarding this change at your home address. If you are an AETNA HMO participant and you have not received such notice please contact the Union hall or HR immediately. In this information sent by the company is a form in which you can fill out and mail back in and you or your dependents current maintenance medications will then be routed to you via mail order or Express Scripts Pharmacy. The Union has requested a copy of this form and it will be on file here at the hall if anyone needs the form for current maintenance medications or if there is a need for future maintenance medications. Also changing is coverage for that of generic medications and Brand name medications for that of the AETNA HMO participants. The change is that AETNA HMO participants will have to pay the difference between the costs of Brand Name prescriptions when generic is available. If a generic prescription is available, and a AETNA HMO participant purchases the brand name prescription, the AETNA HMO participant is responsible for paying the generic prescription copay PLUS the difference in cost between the generic prescription and the brand name prescription up to the brand name per prescription maximum. This difference in cost will not count towards the participant’s annual prescription drug out of pocket maximum. If you should have any questions, comments or concerns with this change please contact the Union Hall at 281-427-1024 or Ricky Brooks at 713-471-2613. Fact – API 755 guidelines are intended for all employees working night shifts, rotating shifts, extended hours/days, or call outs involved in process safety sensitive actions. Fact-ExxonMobil management does not agree with this portion of API 755 and is proposing only including the process divisions which includes 12 hour shift workers as well as 8 hour and 10 hour process employees. Fact-The definition of safety sensitive potions is as follows; Safety sensitive position is a job or position where the employee holding this position has the responsibility for his/her own safety or other people’s safety. An employee in one of these positions has to be with clear mind and diligent while occupying such position. Is this not every position at ExxonMobil Baytown? Question-Why with this legal definition is ExxonMobil management in Baytown only including process employees? Ingrained in this definition is the ExxonMobil Baytown’s site safety mantra of nobody gets hurt because each of us has the responsibility for his/her own safety as well as other people’s safety. But yet the ExxonMobil Baytown management group does not want to include the mechanical division or the lab division or contractors whom all and or at times work night shifts, rotating shifts, extended hours/days, or call outs and again are in a position that is safety sensitive by its very nature as well as definition. Fact-ExxonMobil Baytown Management’s original proposal was that they wanted API-755 in its entirety. Now they only want the hours of service guidelines and they only want to include process employees. This change in position by that of ExxonMobil is because, the API 755 guideline calls for a comprehensive Fatigue Risk Management System to be constructed and this has not yet been done. The comprehensive Fatigue Risk Management System is to be based upon sound science and recognize operational issues, and shall include consultation with key stakeholders in the development and implementation of the local application of the comprehensive Fatigue Risk Management System. Simply stated they do not want you or you’re Union to be part of the development or the implementation of this fatigue policy. But again ExxonMobil’s Management group is not adhering to or trying to administer API 755 they are simply utilizing pieces of the document and or cherry picking what they like throwing out what they dislike and operating under the guise of trying to develop and implement API 755. Fiction-ExxonMobil management in Baytown is trying to adhere to and administer API-755. Fiction-ExxonMobil management is not pushing this API 755 change the Union is pushing ExxonMobil management into this. Fact-USW Local 13-2001 and ExxonMobil Baytown Refinery have a standing and legally enforceable agreement for that of 12 hour process employees concerning API 755. Fact-This agreement states very clearly that Refinery 12 hour process units shall continue to utilize their respective overtime guidelines until these guidelines come in conflict with the hours of service (HOS) guidelines. It further states that if by working the overtime in accordance with the applicable overtime guidelines, the selected employee would create an exception i.e. (eighth day) to the API 755 RP, the overtime shall go to the next eligible employee under the existing Unit Overtime Guidelines and so forth until no exception is created. The agreement between the parties goes on to state very clearly that the following language is to be added to all overtime guidelines as follows; the unit overtime guidelines will be controlling until an exception is created. Fact-The USW Local 13-2001 President as well as the USW Local 13-2001 Secretary with approval granted to them from the USW Local 13-2001 Board of Stewards signed this agreement. Also signing this agreement for the company is the Refinery Manager himself. Fiction-This agreement is not active. The company will try and spin this in that direction; however, this is a legal document in which lays out the parameters for that of 12 hour process employees in the Refinery with specific regard to API 755. 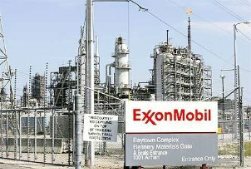 Fact-ExxonMobil management and the Union wanted to achieve a similar agreement for that of 12 hour Chemical Plant process employees as well as a similar agreement for that of 8 hour and 10 hour process employees in both the Chemical Plant as well as the Refinery. Fact-During those discussions/bargaining between the parties concerning 12 hour Process in the Chemical Plant as well as 8 hour and 10 hour employees in the Chemical Plant and the Refinery the company and the Union exchanged one set of proposals. The company then falsely claimed impasse and began to pump out its version of a fatigue policy that in no way resembles that of API 755. ExxonMobil management and USW Local 13-2001 have a legal and in full effect agreement for that of 12 hour process employees. Fiction-The parties are at impasse bargaining a fatigue policy for 12 hour Chemical Plant process as well as 8 hour and 10 hour process employees in the Chemical Plant and the Refinery. Fact-This issue has a plethora of Mandatory Subjects of bargaining subsumed in it, Including but not limited to; compulsory overtime or mandatory overtime, Hours of Work, methods of filling vacancies, safety and health rules. Mandatory bargaining subjects are terms or conditions of employment that vitally affect employees. Therefore the company must bargain with the Union over any or all of the mandatory subjects prior to implementing its proposal. Fiction-The Union is in agreement with the training and documents in which they ExxonMobil Management began to distribute and go over during the first week of November 2014. Fact-Your Union stands ready to bargain at reasonable times and places to achieve an agreement for that of the 12 hour Chemical Plant process employees as well as the 8 hour and 10 hour process employees at the Refinery and the Chemical Plant. Your Union is still awaiting relevant and needed information to evaluate its own proposals as well as the company’s proposals for these specific groups. Fact-Your Union will take any and all legal actions to enforce the agreement that is in place and will solicit grievances from all whom it represents when the agreement that is in place is violated in any regard. In soliciting these grievances your Union will investigate each case and file timely these grievances upon the employer and will represent the individuals whom file these grievances with vigor and will at all times provide exemplary representation to each and every person whom files these grievances. Your Union will also take any and all legal actions required concerning that of unilateral implementation by the company on mandatory subjects of bargaining and that vitally affect the employees in which it represents. Fact-If you have questions, comments, concerns regarding this manner you can call the Union Hall at 281-427-1024, or Ricky Brooks at 713-471-2613. You can also contact your area steward. Fact-A concerted and vigorous action will be required by each and every one of us to address this company created travesty that they ExxonMobil Management are promoting under the guise of API 755. "Do not turn this decision into a numbers game. Nothing can destroy LPO quality and credibility faster than establishing quotas. Each level in the chain of command must carefully communicate the frequency guidelines and steward the LPO process so that quality is not sacrificed to quantity." "LPS requires loss prevention observations on a planned and regular basis. These observations support the goal of maximizing the effectiveness of each occupation. They identify and eliminate deviations from safe work practices and monitor the workplace conditions. LPO's also provide positive reinforcement for correct practices. Industrial research has shown that positive reinforcement coupled with constructive criticism is more effective in changing behavior than either criticism or positive reinforcement alone. "The loss prevention system is not merely an exercise in completing paper work. The loss prevention system is not a paper-driven machine, promoting the status quo and resulting in no real changes. This system is action-oriented, with the main thrust of the tools focusing on meaningful changes in the work place." "Observations should be scheduled well in advance to ensure that LPO's are conducted on target areas and to avoid the perception of a last minute rush." "Base target areas on factual information. Don't guess or shoot from the hip. The target strategy should be "ready, aim, fire", not "fire, ready, aim"! "Avoid quotas and concentrate quality LPO time on processes, occupations, and activities that account for the greatest losses." Above are excerpts from the LPS book authored by James D. Bennett. Some of you may already know this information while others may not. It is becoming more and more obvious that ExxonMobil management is not adhering to the principals of the LPS system. Does your area have a quota system for LPO’s? Has local management communicated that if these quotas are not met that discipline will be issued? If you answer yes to either of these questions please contact the Union hall. Education is key, knowledge is power and communication is paramount. Please let me know if you are having issues with LPS in your area and we will get those issues before the appropriate bodies and work tirelessly to resolve the problem. Your prompt communication back to the hall is greatly appreciated.